Intimus DIS 200/410 Disintegrator uses state of the art technology in order to fulfill high-security requirements for data destruction. 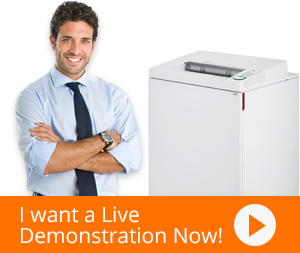 Not only is this shredder reliable, economical, but it is also efficient. Intimus has different security levels based on its screen mash diameter which ranges from DIN level 3 till level 7. It comes with robust and powerful blades that can breeze through staples, paper clips, floppy disks and even credit cards quite easily without any damage to the blades. Moreover, it’s knives can be resharpened several times which allows them to have a long life. Intimus DIS 200/410 Disintegrator is backed with a large feed opening of 16 9/64”× 7 7/8” that is suitable for all standard computer formats. The shredder also supports a solid sheet steel housing with evacuation from the hopper. A clearly arranged operating panel allows Intimus 200/410 Disintegrator to maximize ease and better control overall shredding operations. The shredder is service friendly through an easy access milling chamber as well. Lastly, the shredder has a throughput with B40 of 150 kg/h. All of these features have made Intimus DIS 200/410 Disintegrator the most primary choice of organizations across the globe as it has the capability of meeting the higher security requirements for government agencies etc.